When we think of light propagation volumes we think of awesomeness with a ton of light bleeding, right? Well I do, so I’ve been trying to limit the amount of light bleeding and I find the current result acceptable without being too hackyish. The first change is the injection. Usually I would inject the lighting in the same position as the voxels into a sh lighting map, but, once I do this I don’t have much information on which “direction” the lighting came from if I was to propagate the lighting. In that case I would have three choices, light bleeding, expensive occlusion calculation or not propagating (But the last one wouldn’t be any fun…). So, what if instead of injecting the lighting at the voxel position I inject it with a small offset, this offset would then be proportional to the approximated normal. In this way the actual lighting information would be injected into the empty space. The 2nd change I made was simply discarding propagation in any occluded voxels/cells as the new method doesn’t require it. Now the issue with this is if the cell size ( How much a voxel/cell occupies in whatever unit your system uses ) is way too big compared to the world the propagation will visually fail and look horrible, so to look good a bit of performance is sucked. 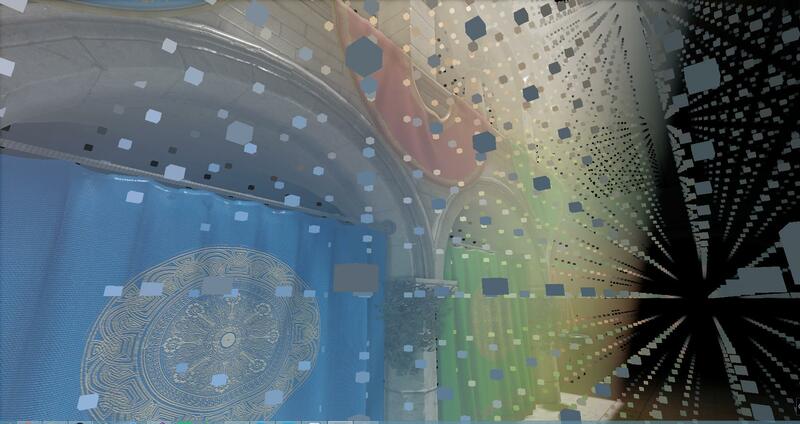 The last change is when sampling the final indirect gi I apply a small offset as at all the lighting information is in the “empty” cells, now one might say that this is a crude approximation but I don’t find it that horrible. So, there you have it, that’s my current recipe to a LPV system without bleeding, there are still lots of things to fix but it’s a start. In my last entry I talked about a cascaded LPV system, however this has slightly changed. You can still configure multiple cascades; however the way it works is slightly different. In each cascade the system will create two grids, a high frequency grid and a low frequency grid (The dimensions of the grid is still intact). The low frequency grid represents the low frequency lighting information, and the high frequency grid will represent the slightly higher frequency lighting information. The two grids are treated as separate grids with different cell sizes but when rendered the energy proportion is taken into account. So I’m fairly happy how my LPV system has progressed and I find the results acceptable, now obviously there’s the issue with the “blocky” look ( If you want an acceptable performance 🙂 ), which I’ll try and mess around with and share my results later on. Now, let’s steer slightly away from that and think about volumetric fog! Yes! That’s right! 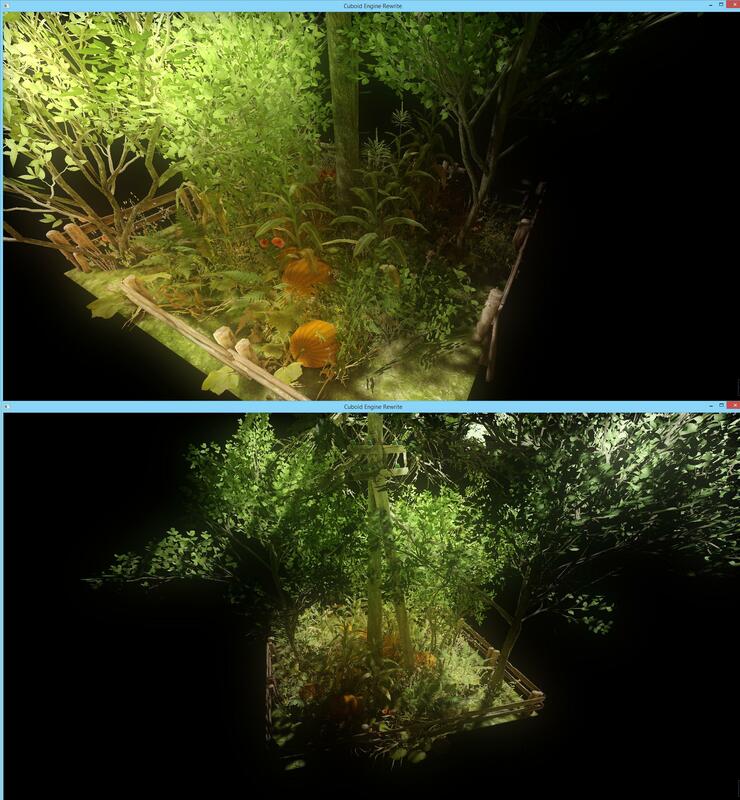 So to make the volumetric lighting feel more “part” of the scene I integrated the indirect gi system. 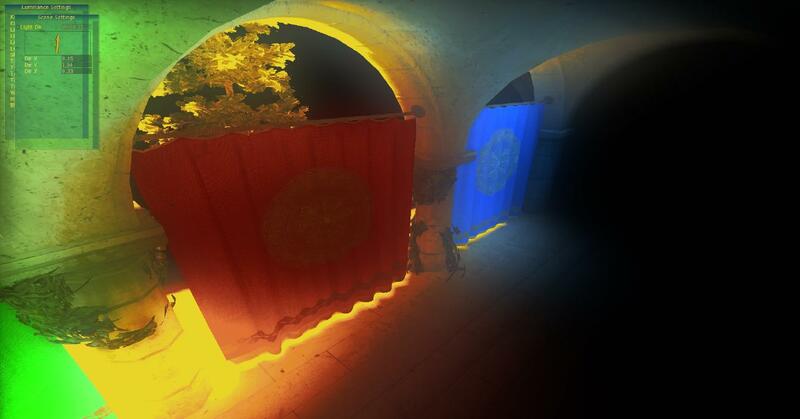 Currently I have a very basic volumetric lighting setup, raymarch from the camera to the world space position at the pixel and slowly accumulate the lighting (The method I used to calculate the lighting is based on “Lords of the Fallen’s” [Game] Volumetric Lighting). 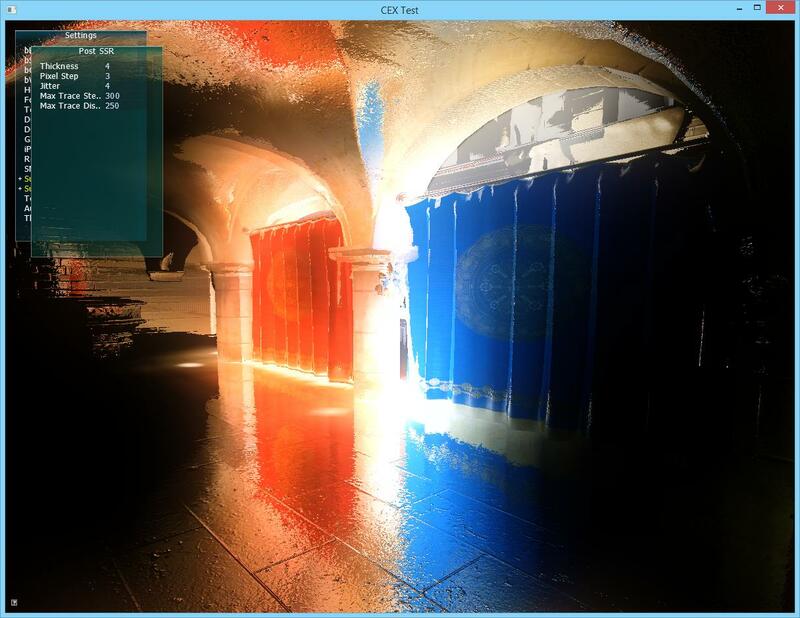 So each raymarch I also sample the indirect gi from the propagated lighting map and multiply that in. And I’m really liking the results! Now some of the stuff will change for sure although it works fine for now. The result of the above is an indirect radiation from the “sky”. And it looks alright! So I’m pretty happy with the module system. In the complete other hand I suddenly have this weird crave to work on my scripting language again… (I know I know, just use an existing one… But where would the fun be in that!? 🙂 ) And I soon need to reimplement some sort of physics engine into this version of my engine. So, there’s still lots of fun! Looking away from some more or less small changes and additions, that’s more or less it folks! It’s been a heavy week though, lots of things happening. 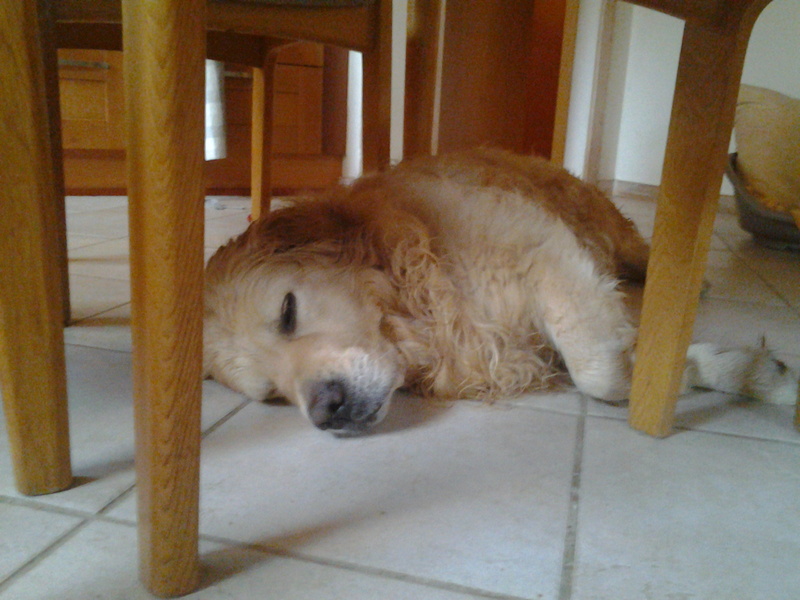 Fx my dog found out that a full day barbecue party is extremely tiring, he didn’t want to walk or anything, slept like a stone… (He loves walks). 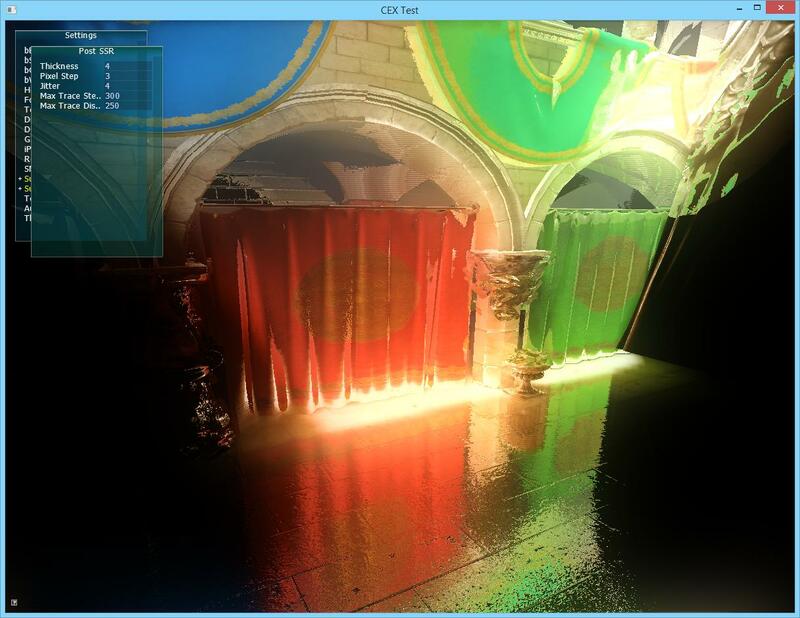 For a while I’ve been thinking about working on cascaded light propagation volumes, so I finally did. 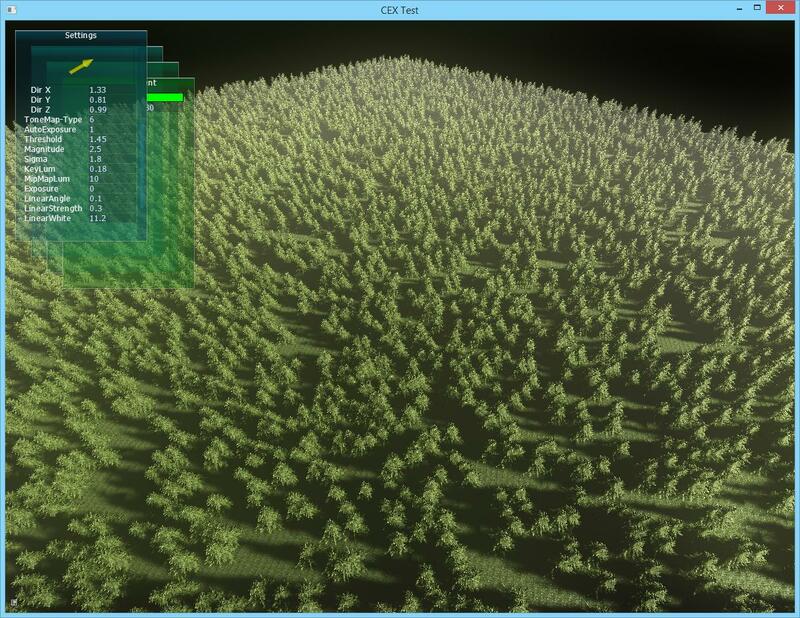 For now I just have a 64 (detailed) + a 32 ( less detailed ) grid that are filled using the voxel caches. Although I have not worked on the energy ratio yet ( My solution is hacky ), I like the result. 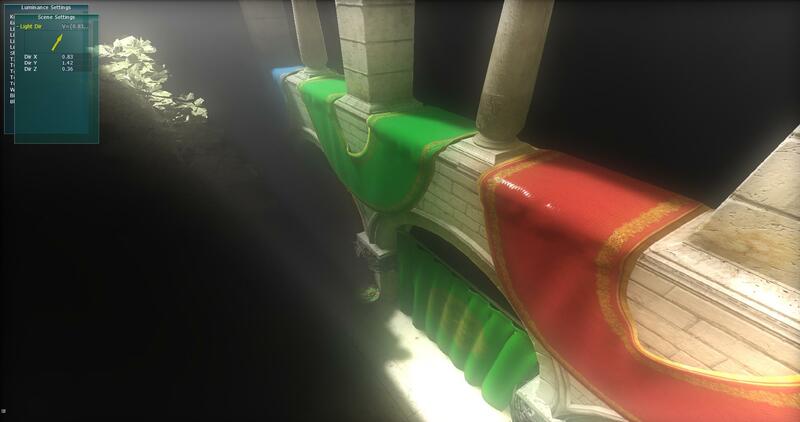 I’ve also worked on my BRDF shading model which is based on Disneys solution, and integrated my BRDF shading model into the LPV system ( Although it’s a simplified version, as we don’t need all the detail and some computations are meaningless in this context ). And I really think it made the indirect colors feel more part of the scene. On top of that the performance of my engine in VS 2015 strangely increased by a few milliseconds which really surprised me. I’m not completely sure what it is. And in VS 2013 I had a strangely huge overhead when starting my application inside VS which made the file io incredibly slow, in VS 2015 this issue is gone and this huge waiting time is gone ( 20 seconds to a minute… ) :). Now, you might say “But what if I don’t want to use it all, huge overhead”, which is true, but, compilers! The cute little compiler will optimize out any computations that aren’t needed, so if you don’t need a certain element decompressed, it wont be (Yay)! So all of that fits together nicely. But at the same time I think I’ve got an issue with the performance concerning filling the gbuffer stage, as it’s huge compared to everything else. 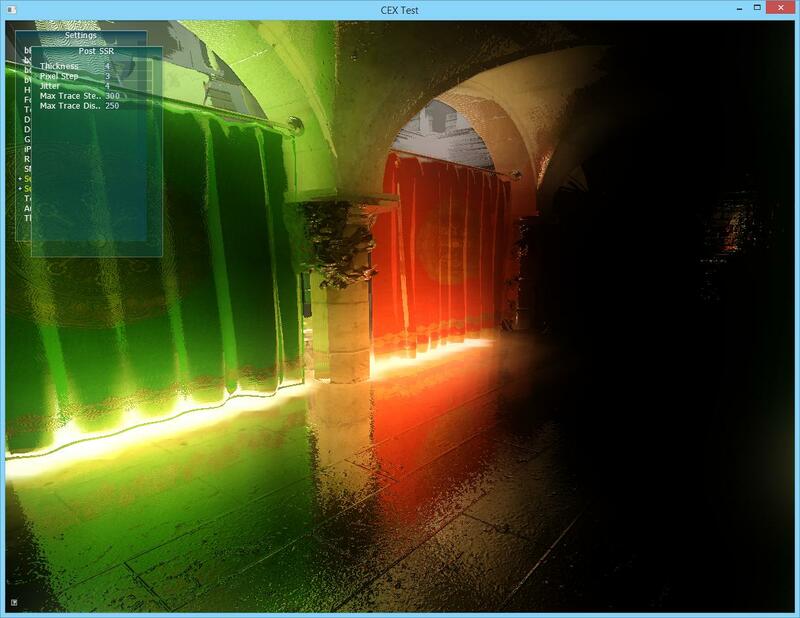 Perhaps it’s the compression of the gbuffer, not sure yet. But, it’s acceptable for now, although I think I can squeeze some cute little milliseconds out of it :). On a side note I’ve also been trying to work on some basic voxel cone tracing but it’s far from done. And I seriously underestimated the performance issues, but it’s pretty fun. Training completed, error falls within treshold of 1e-06! So, overall, I’m pretty happy with it all. But I haven’t been able to allocate enough time ( You know, life and stuff, school or whatever everybody suddenly expects of you ). But if anybody is reading this, can you comment on the colors of the images, meaning do you find it natural or cartoony, I find them a bit cartoony. Well, thanks for even reaching the bottom! There’s still lots of small optimizations to do, and still lots of unfinished “new” features. 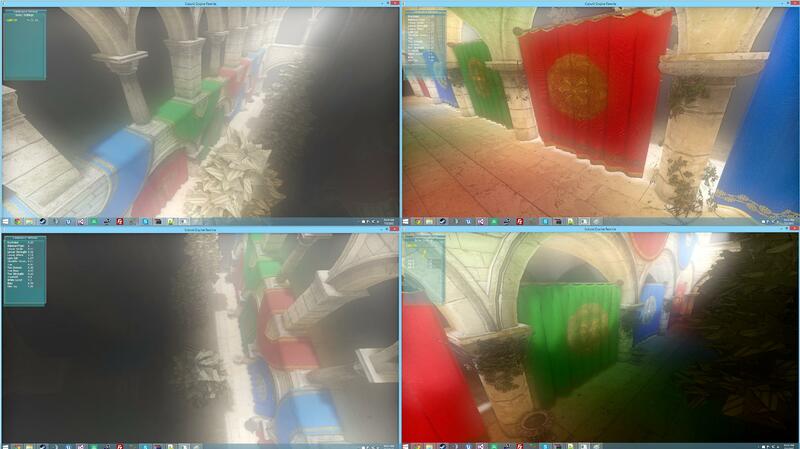 But one of the main things I changed is the way my voxelization system works. Every single time a new mesh/object/whateverpeoplecallit has been added the scene the mesh is voxelized without any transformation applied to a “cache” buffer, this cache buffer is added to some list of a sort. Then there’s the main cache buffer that represents the final voxel structure around the camera. So each frame ( through a compute shader ) all voxel caches are iterated through, then each cell of the caches are first transformed by the current transformation matrix of the mesh ( As each cache represents a mesh without any transformations ) and then fitted inside the main voxel cache ( With some magic stuff that speeds this up ). The awesome thing about this is that every single time the camera is moved / the mesh is moved, scaled or even rotated there no need to revoxelize the mesh at all ( Less frame time, yay ). Currently, all effects combined minus the ssr, showing off volume shadows. Nothing fancy. So while playing around, I found this “mega nature pack” in the Unreal Engine 4 marketplace. So I purchased the package and started messing around, just programmer art . Now all this shows is that I have some serious work to do with my shading model, and I need to invest some time into some cheap subsurface scattering… Btw in the image below the normals are messed up, so the lighting appears weird in some points. 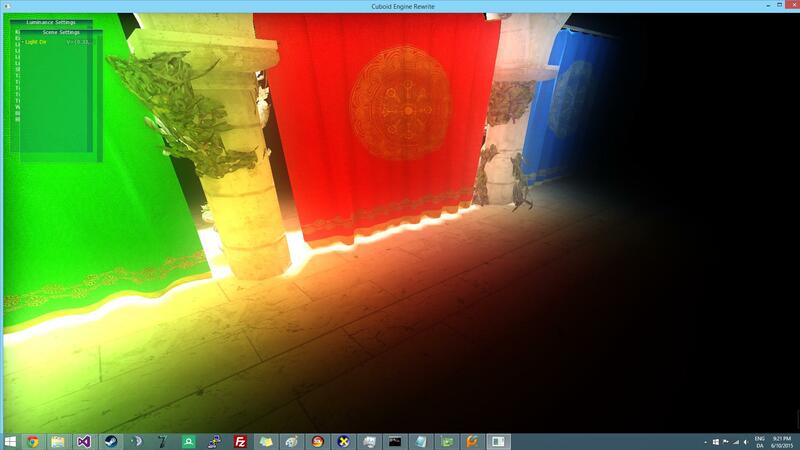 And the volumetric scattering is disabled, since it also desaturates the image a bit ( For valid reasons ). 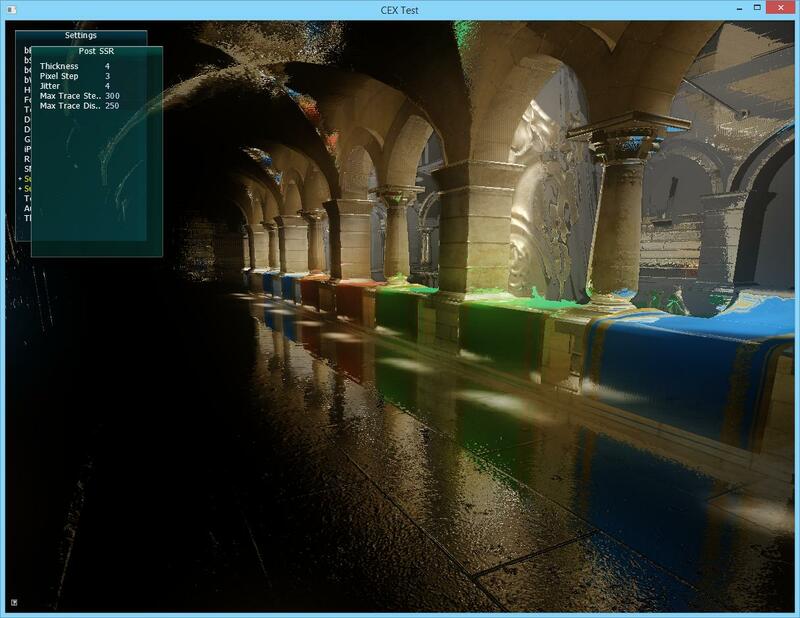 // voxelization not being possible. // He can do whatever he wants! surf.subsurface = 1; // I've got a simple version of some sss, but it's not very good yet. // Aka compress the data into the gbuffer! So that’s more or less it. I’ll keep improving my engine, working on stuff and more stuff. I think I’ll leave the diffuse gi system where it is for a while, since it works pretty well and produces pretty results, now I need to work on some specular gi stuff since I really don’t have a robust system for that yet that doesn’t produce ugly artifacts.